Save Time. Save Money. Save Mess. The Cookie Elf is always on the lookout for easy cookie recipes -- especially for the 95.2% of American households (people like you!) who consume cookies. Baking cookies can be simple and inexpensive with just a bit of know-how. 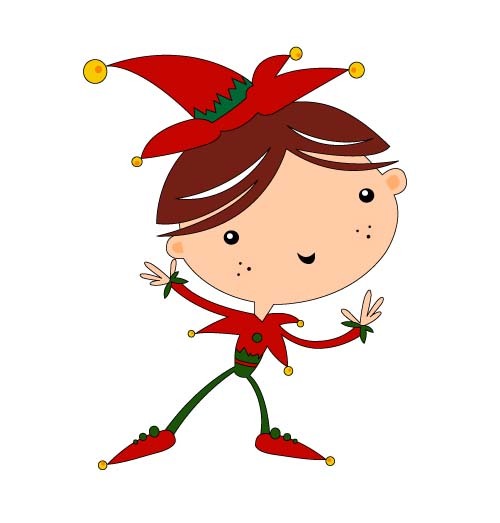 The Elf loves to bake cookies … and gets excited about showing you baking tips and easy cookie recipes, all so that baking cookies is simple and fun for you. You don’t need any special skills to use the simple cookie recipes here. In fact, each one is Elf-tested and straightforward. They’re great for kids, too. As far as the Elf is concerned, the more cookies, the better … if they’re easy-to-make and foolproof. The Elf walks you through baking cookies how-tos, cookie ingredients, baking gear, baking tips …all kinds of time-saving and money-saving baking tips to use whether you’re making your very first batch of homemade cookies or you’ve got decades of experience in the kitchen. The Elf’s cookie recipes are all easy and uncomplicated to make. They have to be -- in order to be part of The Cookie Elf File. Want to know how to organize a Christmas cookie exchange? Find or make an adorable Christmas cookie ornament? Track down Christmas tree cookie cutters? Choose Christmas cookies gifts? Put together cookie gift baskets? The Elf can help you with that, too. Find out more about baking cookies, easy cookie recipes, baking tips, and holiday cookie recipes from The Cookie Elf. Why I started The Cookie Elf – to give you easy cookie recipes and tips for baking cookies so that baking homemade cookies is simple and fun. Get these 8 Easy Kids Christmas Cookies Recipes – a collection of favorite cookie recipes from The Cookie Elf for kids, families, or anyone who wants to bake cookies for Christmas. Get 6 Easy Cookie Recipes – a collection of favorite cookie recipes from The Cookie Elf for kids, families, or anyone who wants to bake homemade cookies simply and quickly. The Cookie Elf File is the Elf’s free collection of favorite cookie recipes and cookie baking tips. Use The Elf’s Cookie Recipe Index to find a favorite cookie recipe or to get ideas for easy cookie recipes to bake. A cookie, originally called a “little cake,” is a small, baked, sweet treat. Cookies can be categorized by how they are prepared, by their ingredients, and by when they are used seasonally. Baking cookies is not hard, especially when you understand basics about cookie ingredients, baking techniques, and baking equipment. Understand the four basic cookie ingredients in cookie dough and additional ingredients that make each cookie recipe unique. Just a few pieces of baking gear are all you need to measure cookie ingredients, mix cookie dough, bake cookies, and store cookies. Top baking cookies tips from The Elf about mixing cookie dough, preparing cookies for the oven, using the oven, and baking times. How to make bar cookies: special tips for preparing the baking pan, preparing the dough, baking the bars, and cutting the bars. How drop cookies are prepared. How to drop dough and special tips to keep drop cookies from spreading too much while baking. Filled cookies are made from cookie dough formed into a pocket or cup, which is loaded with fruits, nuts, chocolate, or other fillings. Fried cookies and how to make them, including tips for preparing the oil and frying the cookies. Molded cookie basics, including tips for making hand-molded cookies and cookies formed in molds. How to make no-bake cookies, with special tips and no-bake Christmas cookie recipes. How to make pressed cookies, with special tips, and Christmas cookie recipes. How to make refrigerator cookies, including baking tips for preparing the dough, chilling the dough, slicing the cookies, and adding a decorative edge to cookies. How to make rolled cookies. Special tips about how to roll out cookie dough and use cookie cutters. How to make sandwich cookies. Special tips and recipes for sandwich cookie fillings. Basics about brownies, America’s favorite chocolate bar cookie: their history, flavorings, rise in popularity, and differences with blondies. Cake mix Christmas cookies are an easy way to stir up a batch or two (or more) of delicious cookies. The story of how chocolate chip cookies first came to be and how their popularity spread. Fun facts about chocolate cookies, chocolate chip cookies, and chocolate brownies from The Elf. Gluten-free Christmas cookies are made with ingredients that avoid gluten. Find out what function gluten performs in cookies and how these functions can be replaced by other ingredients. Jumbo Cookies: baking tips that make it easy to bake oversized cookies for your next cookie basket, picnic, bake sale – or simply to eat. How Rice Krispie Treats were developed and how they became so popular. Shortbread is a crumbly, sweet cookie originating in Scotland. Its defining ingredient, butter, produces a rich flavor many associate with British tea time. Use these time-saving baking tips and Elf-tested Halloween cookie recipes to have fun with your family and make memories. Italian cookie recipes represent the country’s culinary traditions, from biscotti to pignoli to pizzelles. Cookies play a special role in Italian weddings and holidays. Baking Valentine cookies is a perfect way to show love to your family and friends. Irish cookies, also called biscuits, are known as favorites across the world including Irish shortbread, Irish soda cookies, Irish lace cookies. The basics that explain what a Christmas Cookie Exchange is and why it’s a fun holiday tradition. Cookie gift baskets are a fun and cost-effective way to legitimately practice your baking addiction and to knock out your gift list. Mark your calendar with these special cookie holidays to celebrate baking and eating cookies all year long! Fun cookie trivia and cookie facts about eating cookies, baking cookies, cookie cutters, cookie jars, and official cookies. Cookie quotes about eating cookies and baking cookies – for fun and inspiration. Get 10 Best Cookie Recipes for free – and access to The Cookie Elf File.